Bush DAB portable goes Lip Gloss Red | What Hi-Fi? The TR04DABRED has a two-line LCD display panel on the top with blue LED backlighting, with the result that "gone are the days of pressing old-fashioned buttons and twisting knobs to get a clear radio station". 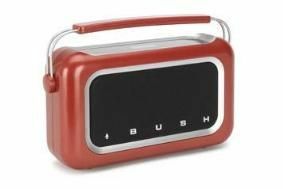 The radio, which was previously available in gloss black, has a matching red and chrome handle, and of course the classic Bush logo on the speaker grille. With both DAB and FM tuning, and 10 presets on each channel, it sells for £50.